6. Websites of a PAP town council, several government ministries, the Prime Minister’s Office, the Istana, some schools, and The Straits Times, got hacked into by figures including that which used the identity of the “Messiah” (allegedly on behalf of Anonymous). Particularly, the hacker of the Istana website left an image with the words “Jiak Liau Bee” beneath it. The one of ST left the words: “Dear ST: You just got hacked for misleading the people”. These happened in June. http://bit.ly/1dk7d4Q. http://bit.ly/1cPAjuB. Firstly, here is wishing the casualties well, extending our appreciation to the men and women on ground helping out yesterday, and also sympathy to the victims of this tragedy including those who felt injustice upon them, the injured driver and assistant, and also anyone at the scene so affected. It is understood that there is some noise about some netizens making racist, xenophobic or otherwise insensitive remarks following the riots. The remarks in question seem to be that of offensive tone towards foreign workers, particularly those from India and Bangladesh that were involved in this incident. These comments can come from both opposition supporters and ruling party supporters alike. We, in fact, believe the more sinister comments could even come from those that support the ruling class as they come from a more elitist point of view, looking down on the lower classes and possibly, the coloured races. While that may be generalising towards people of a certain class, we cannot deny the fact that the deep nature of the ruling party is one aligned more to the right, with all-the-while overly-nationalistic overtones. Also, past experiences with ruling party figures making racially offensive remarks (and facing Parliament’s insensitivity; think Choo Wee Khiang’s case where the Speaker of Parliament did not feel Chiam’s call for order was warranted) give us more concern on institutional and higher-level prejudice and discrimination than those of individuals, although we cannot disregard that aspect as well. And while we stand against offensive speech including those of racialist or xenophobic slant, small vibes and jokes, especially those that are not even sinister or ill, however, should not be blown out of proportion. This is especially so when ruling party supporters like to use some of our comments to discredit us in a way that is way unfair particularly because they themselves make the same mistakes from time to time. Our cause needs to go on and we cannot be disturbed by the less-than-sensible amongst us. At the same time, we will not be deterred by those who intentionally want to thwart our cause by trying to paint us all in bad light. We continue to question, and as we do so wisely and passionately, we try to gain the trust and respect of all Singaporeans so that we unite in bringing about a Singapore that can see a better future ahead. This week the news was dominated, at least for those of us who believe that the fundamental freedoms define our citizenship, by the Attorney General’s application to sue the blogger, Alex Au, for scandalising the judiciary. Alex had written a post on his blog, Yawning Bread, in early October where he reported “a common view” – on which I had also speculated – that that the High Court manipulated hearing dates in the two Section 377A constitutional challenges before it. The bulk of the blog post was dedicated to an analysis of the court processes in the two cases. The timetabling, what he described as a “neat theory”, was only mentioned in passing. Note well that even so, he did not accuse the judiciary, he merely speculated on the “strange calendaring”. Nevertheless, the Attorney decided that Alex scandalised the court and seeks his punishment. Although abolishing this crime in this country will make very little difference because the law is entirely obsolete, it will make a difference in the rest of the common law world. All the textbooks, including that of the noble Lord, Lord Borrie, say the same thing, which is that, although this is an outmoded and archaic offence, there remain many parts of the common law world where it is enforced. The most notorious example occurred in Singapore last year, where Mr Alan Shadrake, who wrote a book criticising the Singapore judiciary’s attitude towards the death penalty, was committed for contempt, sentenced to prison, fined and told to pay legal costs. This gentleman, who is about my age and a distinguished senior writer, was condemned in that way, with the Singapore Court of Appeal applying its view on our case law and this offence. By abolishing the offence today we do not really change much in this part of the world because, apart from what happened in Northern Ireland, it is simply never invoked anymore. However, it will send an important message across the common law world. The judges on the Singapore bench, it seems, are made of flimsier stuff. Apparently, they are unable to smile wryly. Twice this year contempt laws were invoked against a cartoonist and a filmmaker. In another case the blogger, Han Hui Hui, was threatened with suit by the Council for Private Education, a statutory board, for highlighting poor standards in a private college. The CPE later withdrew its suit. I have no doubt that our society must open up further…. Looking ahead, one important task of the government will be to promote further civic participation, and continue to progressively widen the limits of openness…. We will promote a political culture which responds to people’s desire for greater participation, in a manner which supports Singapore’s growth as a nation. Perhaps the timing is telling. It is midway between general elections and the government is getting nervous. In the last two elections the popular vote declined by 15%. 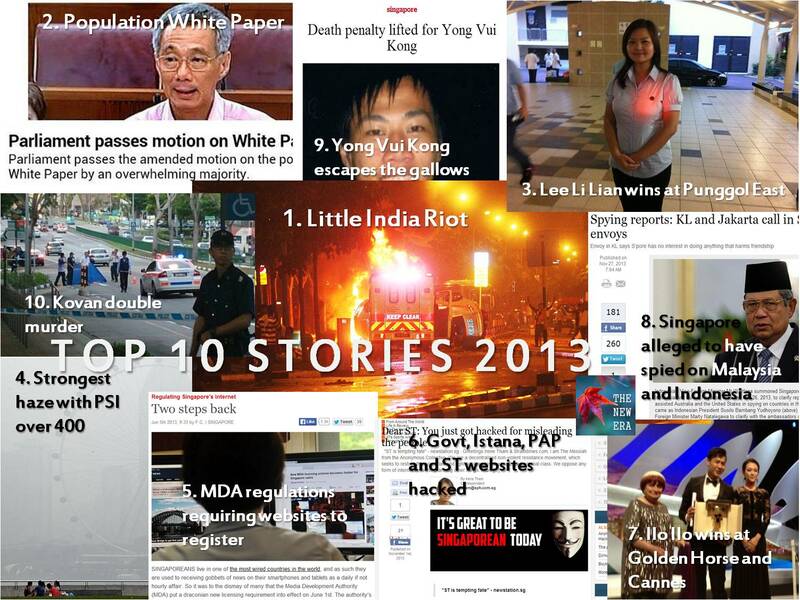 The PAP’s performance to date; persistent poor showing in industrial production; prices continuing to rise; corruption in the public service; a slew of protests at Hong Lim Park; and the dismal performance of several ministers, not to mention the loss of another constituency via a by-election, is making it view the internet as the enemy. For it is there that the thoughts and aspirations of citizens, much of it inimical to the government, are expressed. Ministers, particularly the new ones, began their term of office with such confidence, opening up Facebook accounts, initiating a National Conversation, approaching hitherto taboo policy areas, and even taking upon their lips the words ‘human right’, once so calculated to attract the animus of PAP leaders. But in these last several months, we see a different side to our sorry-saying, promise-making, we-will-do-better cabinet. One of the pillars of PAP dominance was its ability to set the agenda by getting the cooperation of a small number of gatekeepers in the establishment media, and by forcefully keeping everyone else out of the game. Suddenly, there are many more new players and the old legal, political and economic carrots and sticks don’t work. The very word “secrecy” is repugnant in a free and open society; and we are as a people inherently and historically opposed to secret societies, to secret oaths and to secret proceedings. We decided long ago that the dangers of excessive and unwarranted concealment of pertinent facts far outweighed the dangers which are cited to justify it. Even today, there is little value in opposing the threat of a closed society by imitating its arbitrary restrictions. Our current administration views the internet with horror. As far back as 2007, the PAP set up a subcommittee to combat negative information. Its allies went online to put their perspective, usually nothing more than innuendo and character assassination. Following the 2011 GE, the campaign stepped up with dedicated Facebook pages uttering the most preposterous falsehoods. And then sometime last year, the maladroit minister over at Communications and Information, floated the idea of an internet Code of Conduct. Assuredly the idea went down like a lead balloon with our opinionated bloggers. In his usual way, the Minister blundered through the morass for a few weeks and then quietly dropped the idea. Not even his sister, an editor at The Straits Times, could help him there. For a few months, all became quiet on the Western Front. The government was brooding. They saw that all was not good. Then came the first assaults. In December last year, when more than 150 bus drivers went on strike, the Minister for Manpower applied the defamation laws to me in response to a long Facebook Note querying his assertion that sufficient avenues existed for labour grievances and therefore the drivers should not have gone on strike. Later, Alex Au was attacked, this time by the Prime Minister. Then came Lynn Lee, then Han Hui Hui, then Leslie Chew. Later still, new MDA Regulations were made to regulate blogs and news sites. Tessa Wong of The Straits Times dutifully wrote a sordid two-page spread about the blogosphere, complete with photos of the more popular – and therefore, culpable – writers. A little further on and a Minister, in a most unparliamentary display, criticised a popular blogger on the floor of the House during a debate on the Haze. Later still, Minister Tan Chuan Jin issued a mealy-mouthed diatribe against “keyboard warriors”. And in recent weeks we heard that the Law Minister will bring new legislation on cyberbullying next year, citing a weak – indeed extremely weak – survey carried out by Reach Singapore. First, it must have confidence in itself that it can win debates fair and square, without recourse to unnecessary force. Second, it must have confidence that democracy works, and that the majority of Singaporeans would support a government that does the right thing in the right way. Third, arising from this confidence, it must relax its grip on the mainstream media and allow professional journalists to do their job of fearlessly serving the public interest. And fourth, stop using laws like defamation or contempt against critics when you could persuade more people by simply engaging the debate. Basically, never pull rank online. Win respect by being right, repeatedly. Preventing criticism contributes to a public perception that judges are engaged in a cover-up and that there must be something to hide. Conversely, open criticism and investigation in those few cases where something may have gone wrong will confirm public confidence that wrongs can be remedied and that in the generality of cases the system operates correctly. President Kennedy again: “Without debate, without criticism, no administration and no country can succeed – and no republic can survive.” The Prime Minister must come to understand this. His father’s sledgehammer and knuckleduster cannot be the tools which he will use in the twenty-first century because they will not work. The Attorney General’s action – and let us be clear, he is not acting at his own instigation but at the behest of the government whom he serves as its lawyer – is an indication that the government has not come to terms with the reality of the internet. It fears the free flow of information; it is afraid to allow its arguments to stand on their own merits. If it allows this legal action against Alex Au to take its full course, it will serve the cause not of discipline but of resentment. It cannot be so witless as to believe that this will reap a dividend at the next elections. It will not. Why people feel uncomfortable voicing out on political and social issues? “Why would people feel uncomfortable voicing out their views on political and social issues? The question is: Do you want it bad enough?